What exactly do we mean when we use the phrase “digital literacy”—is it a skill that can be taught, a set of tools to be used, or an educational framework for engaging students? In 1969, John Debes, co-founder of the International Visual Literacy Association, coined the phrase “visual literacy” to encapsulate the increasing need for multimodal learning and technological fluency in the Information Age. Since then, we’ve updated the term to digital literacy—in large part due to conversations surrounding Paul Glister’s 1997 book by the same name—as we continue to recognize the value of multimedia resources and information networks in the classroom. Yet, as scholar and educator Doug Belshaw has pointed out, as the term has evolved, the phrase “digital literacy” now encompasses several different competencies and modes of communication. In recent years, it has been used to include Debes’s original visual literacy, as well as information literacy, technological fluency, and multimedia awareness. As a result, it can be hard to understand exactly what we mean when we use the term, and even more confusing as we build classes and curriculums around incorporating digital literacy in the classroom. At the heart of the matter remains the question of why literacy—any literacy, not just the technological—is important to education. Claire Bélisle argues that the issue of literacy is not just one of functional competence that allows us to practically communicate, but also one of needed intellectual empowerment. This is the crux of Belshaw’s argument, and the reason why digital media in the classroom is so necessary. By both Belshaw’s and Bélisle’s reasoning, the “condition” of digital literacy is already a fait accompli of living in a technologically mediated global society. As such, the question is not whether schools and programs should work towards curriculums that embrace new technology and media. Rather, it is a question of how educators can best incorporate these new resources and competencies into their existing syllabi and course foundations. Yet, one of the biggest roadblocks for educators trying to build digital literacy practices in the classroom is access to resources, including technology labs or digital media libraries. Students often face a cognitive disconnect between their hypermediated social lives—which are defined by Web 2.0, cloud computing, and an infinitely expanding glut of remixed popular media—and the analog realities of many classrooms. The result is a digital literacy gap, in which students’ technological skills and competencies outpace the critical inquiry and reflection necessary for true intellectual empowerment. 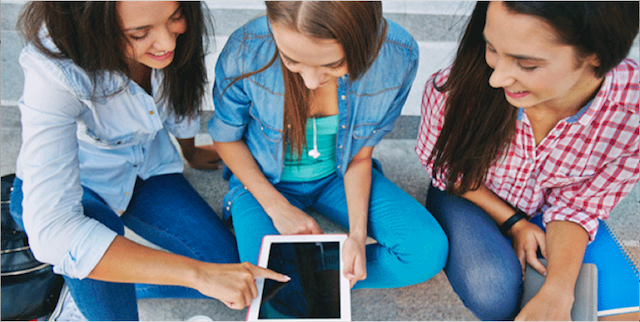 To see how VideoBlocks is helping educators improve digital literacy in the classroom, download our eBook Digital Literacy On-Demand or explore the media resources in our Digital Backpack. Sign-up to get the latest trends, offers, and insights from Storyblocks.